We live in a world where online consumers use multiple devices at the same time and often crosscheck information before making a purchase. During their journey, users are exposed to a variety of ads and perform multiple searches. By default AdWords gives all the credit for the final conversion to the last ad click. Does this setting really reflect the complexity of the choices and interactions made by the users? Not at all. This is the reason why in this chapter we will talk more about the different attribution models and the credit they assign for each stage of the purchase path. Attribution models help you optimise your campaign accordingly to your users conversion path. Why are there different attribution models? Imagine that a new shop has just opened in town. The last thing that new customers will see before entering is the shiny banner outside which helps people to learn the business name and usually gives people an idea of the products on offer. But is the banner the main reason for new client visits? We all know that the answer is no and that visits are often influenced by online reviews and/or searches for that kind of shop in the area. Understanding what influences acquisition of new clients justifies the existence of different attribution models. Last click attribution gives full credit to conversions from “last clicked” keywords. It’s the most conservative model in terms of growth. It’s ideal for small businesses with limited budgets that want to identify high converting keywords. First click attribution gives all credit for conversions to the “first clicked” keyword. It’s the most growth-oriented model. It’s often used by by advertisers with bigger budgets who need to generate new leads. With linear attribution, the credit for conversions is distributed equally across all clicks on the conversion path. It reflects a moderate growth strategy. It’s definitely recommended if you want to test your assumptions and effectively understand how each stage is contributing to a conversion. Time decay attribution gives gradually more importance to the stage happening closer in time to the final conversion. It reflects a conservative growth strategy. It’s a model designed for businesses with a long sales funnel (B2B for example), and helps to identify ads that drive action. Position based attribution gives 40% of credit to the first and last clicked keyword, the other 20% is spread across the other clicks on the conversion path. It’s a growth oriented model. It’s particularly effective to measure end to end performance while still placing most of the importance in the first and last clicks. Data-driven attribution gives credit to the clicked keywords based on how crucial they were in the conversion process. The growth strategy is based on the account performance. This model uses advanced algorithms to elaborate the data in your account and determine the most important stages. It’s an option available only to advertisers which have enough data in their account. Before choosing the right attribution model, you need to have a detailed understanding towards the needs of your business and the results you want to achieve. Also, depending on the sales cycle of your product you may prefer a model to another one. If you are new to AdWords, have a limited budget and want to generate as many conversions as possible, the “last click” would be the most recommendable model (also the default one). On the other side if you have a bigger spend potential and the need to generate as many new leads as possible the “first click” model would be a more suitable option. If you want to test all of the different conversion stages to see what performs better, then the “linear” model is the right answer for you. If you are in B2B and sell products with a long sales cycle, then “time decay” would be a great fit for your campaign. On the contrary, the “position-based” model is not used by advertisers who have a long sales cycle as the initial touch-points (following the first one) are underestimated in comparison to the “time decay” model. The “position-based” model represents a good compromise for advertisers with a reasonable budget who want to balance their lead generation and sales effort. Last but not least, the “data driven” model is a fully customised model based on an algorithm analysis of your campaign results. The high level of complexity and specificity makes this model the most effective for every kind of business. However before starting using it you need to have at least 15000 clicks on Google search and 600 conversions within 30 days. You can test how your campaigns would perform with different attribution models by going to the AdWords header and clicking on “tools, billings and settings”, then click on “search attribution” and select “attribution modelling”. You will be able to compare the performance of 2 attribution models at the same time. To change the attribution model for your conversions campaign, click on “tools, billings and settings”, then choose “conversions”, select the specific campaign and click on “edit settings” (see screenshot below). Important: Attribution models are only available for the search network and shopping ads. Attribution models help you to understand where you need to invest resources during the customer journey. They can help you improve your bids based on how your ads are performing and they can assist in meeting your potential clients earlier in the sales cycle. Ad groups also contain a lot of keywords with “hidden” value, that at first sight, you may think are underperforming. 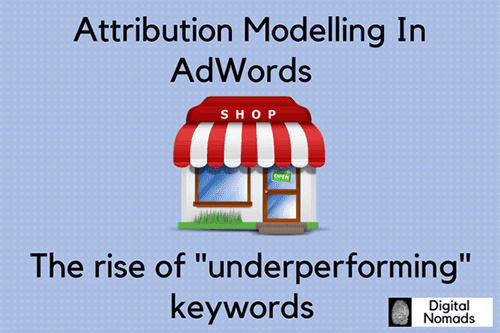 Attribution models help you to uncover the real value of these keywords. This could mean identifying terms you think are too broad or feel are not a good fit to complete the conversion cycle but are actually quite valuable to use. After assessing the value of each keyword, you can start optimising your landing pages to support their place in the customer journey. For example, you may want to link broad keywords to more informative parts of your website and specific ones to conversion oriented landing pages. If you are still unsure which kind of attribution model best fits your business let have a chat!